This page is a Kaleberg report on Sol Duc Falls, a wonderful taste of the Olympic rain forest. There are more Kaleberg reports on the North Olympic Peninsula. 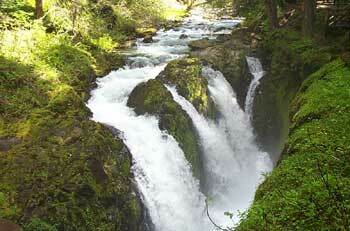 Sol Duc Falls is one of the wonders of Olympic National Park. If you only know the Sol Duc River as that lazy, looping river that follows route 101 out to the West End, the powerful, misty, thundering falls stand (and perhaps fall) in great contrast. The short trail to the falls gives one a good taste of the rain forest with its mysterious green valleys, verdant with ferns, salal, and the great trees rising to form a protective canopy. The trailhead also serves as a gateway to a number of more ambitious trails, including one of our favorites, the trail to Deer Lake and The Potholes. There is also the Sol Duc Hot Springs Resort, and the drive to the trailhead gives one tantalyzing glimpses of the river as it emerges from the Olympic Mountains and begins its long, lazy, winding route to the Pacific Ocean. 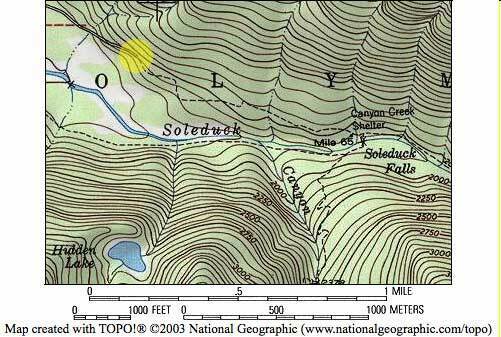 To get to the trailhead, take the first left to the west of Lake Crescent on route 101 and head south on Sol Duc Hot Springs Road to the end. The resort is on the right a mile or so before the trailhead, and it's a good place to stop to check trail conditions, particularly during the shoulder season. Along with the hot springs (more on these below), there is a restaurant and a small shop selling souvenirs, food and notions. The hike has some easy ups and downs and leads from the trailhead through a lush rain forest to the falls. There are streams to cross, little waterfalls to explore, and great trees to marvel at. The rain forest is another world, and the valley topography is hidden. You can hear the falls as you approach them. 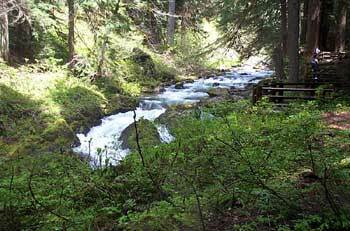 In the spring and early summer, they are at their strongest, but the Sol Duc is always powerful here. It is quite different from the river one sees as one heads west on route 101. You can double back along the far side of the river and follow the rapids back to the resort. (There is a bridge there). You can continue along the Sol Duc for miles and miles. You can take side spurs to Hidden Lake or Deer Lake (more on this below). 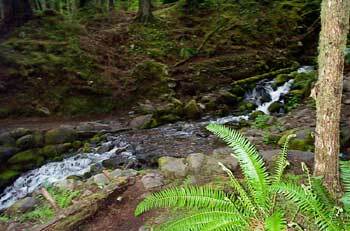 The mineral waters at Sol Duc Hot Springs Resort can be a disappointment. There are indeed hot springs and bathing facilities, but don't imagine yourself swinging from vine to vine in some virgin wilderness pool. The hot springs are real, and we don't doubt their curative powers, but for reasons of hygiene and safety the healing waters are pumped into a set of swimming pools at varying temperatures and concentrations. If you are coming for the cure, or just a pleasant day, or stay, poolside, this is the place, but do check the website, and reserve if you plan to stay in season. 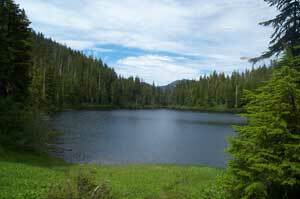 One of our favorite hikes from this trailhead is to Deer Lake and The Potholes. It's a high climb, 1600' to the lake and about 2400' to the potholes, and you can climb even higher to the High Divide if you have the stamina. We don't. If you don't mind camping, you can even take a multiple day hike covering the the Seven Lakes Basin which includes Deer Lake and several others. 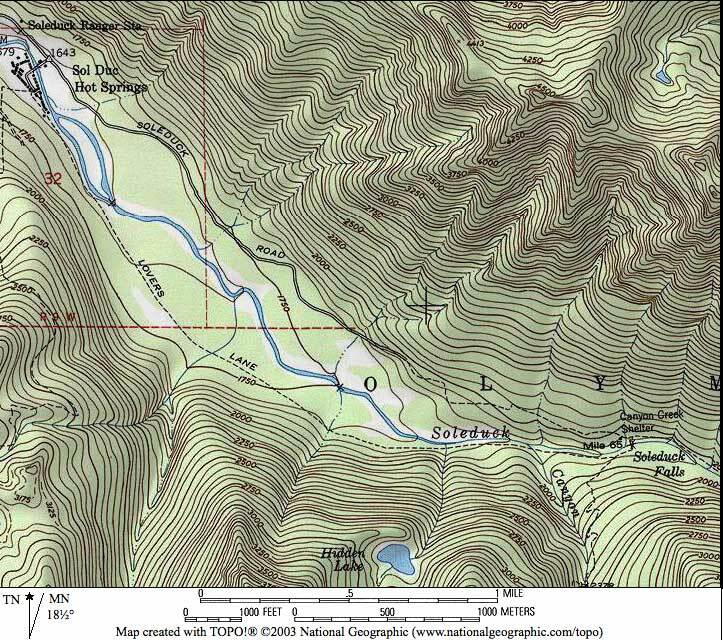 For a larger view of the area showing the Deer Lake hike, click here. Check in at the Sol Duc Resort en route to the trailhead for trail conditions, especially in the spring and early summer. This is an easy hike, so it is good for an off day, or if you have small children. You will get wet on the bridge by the falls. That's part of the fun.